We manufacture various size of Hydro Extractor Machines from 36" to 60" dia and various number of packages for extracting of cones. 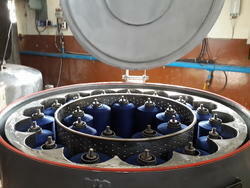 Our manufactured Hydro Extractor Machine is widely used for drying yarns, fabrics, clothes, silk, etc. with the help of centrifugal force. These Hydro Extractors are designed by our skilled personnel for commercial use and should be bolted to a solid concrete floor. This machine is best suitable for yarn cones & packages on ss spring or plastic tubes. Our machine is available in various capacity - 30, 50, 75 ,90 cones or packages. Our manufactured Hydro Extractor Machine is widely used for drying yarns, fabrics, clothes, silk, etc. with the help of centrifugal force. These Hydro Extractors are designed by our skilled personnel for commercial use and should be bolted to a solid concrete floor. 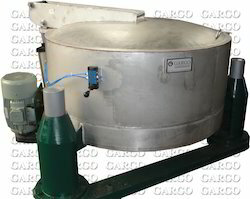 This machine is best suitable for textile, dyestuffs and food industries, requiring filtration of various types of slurries and hydro extraction from pastes and clothes. We are looking queries from India.